After creating Long Tail Pro, one of the most common questions that I get is, “What is the difference between Market Samurai and Long Tail Pro?” Well, trust me, I could go on for hours. But rather than do that, I decided to make a video that demonstrates some of the basic differences between the 2 keyword research tools. Overall, I have to give Market Samurai credit for creating one of the earliest mass market keyword tools. In fact, I think Market Samurai is a great tool overall, and this demonstration is just meant in good fun. 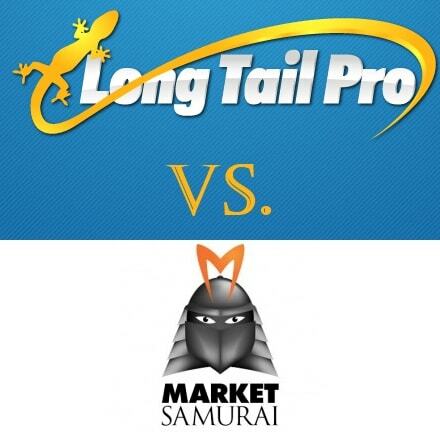 I wanted to simply highlight one aspect of Long Tail Pro in comparison to Market Samurai. So overall, Market Samurai has a lot of great features, but it could be better. In fact, I created Long Tail pro because of how slow the keyword generation function was for Market Samurai. Rather than take my word for it, watch this video. In this video, I timed how quickly Market Samurai can generate the keyword results for 5 seed keywords vs. Long Tail Pro. Check out the video to see the stop watch, and you be the judge which tool works better for finding keywords. Do me a favor. If you think any existing Market Samurai users would enjoy some of their time back, tweet this video out by clicking here. Market Samurai can only generate 1 seed keyword at a time. Long Tail Pro can generate multiple seed keywords at once (5 at a time show in video). Market Samurai requires you to hit generate keywords and then once complete, push a separate button to generate CPC data. Long Tail Pro does it all at once. Market Samurai makes you hit a separate button to apply filters (search volume, CPC, etc). Long Tail Pro does it all at once. Market Samurai has to re-generate data (taking more time) if you change your CPC filters. Long Tail Pro already has the data, so filters are applied instantaneously. Market Samurai can only find domains after going through several steps AFTER keywords are generated. Long Tail Pro can generate domains all at once. Market Samurai requires your attention at every step along the way. Long Tail Pro completes all tasks after pushing one button and does not require your attention. Overall, it took Market Samurai about 25 minutes to simply run 5 seed keywords, and this required my constant attention to move it along the process. Long Tail Pro performed the exact same task PLUS found all exact match domains in just 3 minutes. I obviously can't cover all the differences between the rank checker and competitor analysis here, so I'll save that for another post. Overall, from my perspective and from the perspective of existing Long Tail Pro users (thank you! ), the time saving benefits of Long Tail Pro are enormous. Hope this video helps anyone that may not have fully realized the differences between the 2 pieces of software. And finally, yes, you may have noticed a couple of new looking things in the video. What you saw are a couple of new features that will be coming out soon. But I'll reveal more on that at another time…. For those of you who have not tried out Long Tail Pro yet, you can get a 10-day trial version of the software right here. Everything you saw in the video is available in the trial version. Thanks for watching, and I would love to hear any thoughts or questions that you might have below. What did you think of the video demonstration? That’s why I choose LTP as my primary keyword tool! This tool was great in finding niche. I found out that very often LTP is a bit slow to load the first keywords after the first launch but afterwards its pretty quick. Plus, the demo is pretty clear, Market Samourai is soooo slow… nevertheless, i can see a lot of features on MS that does not seem to be available on LTP? Anyway, do you already have a release date for the new LTP version? Beta will be in the next week or so. Long Tail Pro gives me all the data that I need to make decisions and it does it so fast compared to MS. I always recommend LTP when possible. I don’t think one should bash the competition in order to market one’s own product, that is just my opinion. To compare just one feature of the product in one’s own favour is hardly a valid comparison of the whole software. I’m sure both products have their good and bad sides. Btw, the link in the email about this post was bad. Hi Spencer, your software is top-notch. I have helped at least 30+ of my clients to find good domains for their business, blogs, etc. and for myself as well! @Henrik, I respectfully disagree with you. I have owned MS since their inception and also was a beta tester for Spencer. Few months ago MS let all their clients down and went downhill. I have problems almost every time I run MS. Comparing two products in real time and see their results is far from bashing it is the true! How many computers can you install LTP on? Thanks! What happens if I replace one of those 3 computers? Just let us know, we can get you another license – no problem. Saving time is great! But what about the # of keywords generated? I see in LTP it generated 122 keywords from the 5 keywords. How many keywords in total for all 5 keywords did MS generate with the same filter criteria? Owen, the exact same number of keywords were generated using Market Samurai vs. LTP. The tools get the keywords from the same place. As you saw in the video, LTP had generated around 3,200 keywords based on those 5 seed keywords. The filters removed all the unwanted keywords. (Both tools will generate a maximum of 800 keywords per seed keyword). How much RAM do I need to use LTP? I have just 1 GB of RAM in my nettop, and I had problems the last time I purchased my copy of LTP, so much so that I had to ask for a refund. I guess I have to upgrade to a better machine to use this software. That should be plenty of RAM. You can always try the free trial to see how it functions. hmm… I posted…or at least I thought I did. Does LTP support proxies? Not at this time; perhaps in the future. hmmm…beta you say? Would you like a tester? I’ve got several kw tools besides MS (Use what’s best for a particular job), and would be interested in this new version. All existing LTP users will have a chance to beta test. Hey Spencer don’t forget to add google login credentials saving feature… it’s kindda annoying i have to reenter my username and password each time i login.. also can you reduce long tail pro logo size? it sticks out big time and i do my IM mostly during office hours hehe.so wouldn’t want someone to google it and find out what i do during my work..
I’m a very happy user of LTP! I’m very pleased with the software, and especially the support the Spencer and his team provides! Great stuff, and I’m looking forward to seeing what all the new version has in store! I have tried many keyword research softwares including Market Samurai and Keyword Canine and the best I have appreciated is Long Tail Pro. After experiencing Market Samurai taking forever to return data, even after all the recent well publicized changes, I may give Long tail pro a run, Spencer…. It does look quite good…….. I have given MS the benefit of the doubt over the past 6 months to a year, though, if I wrote a MS review now, it will be missing a few stars….. Thanks Danny! Glad you are enjoying Long Tail Pro! Hello, I pressed the link, get a 10 day trial version……And oddly the page opens to say that ‘The 10 day free trial is not available’? As I am a newbie I am evaluating tools at present. But Spencer, how is the KC really calculated? Does it take the PR of competitor’s backlinks into account? It takes the PageAuthority of competitors backlinks into account (which is similar but more accurate than PR). So, the authority of backlinks is accounted for in the KC calculation. Thanks for the demo. Now, the difference is much clear. It is 2014 and Long Tail Pro is faster than ever. Thanks.